Gallery Oldham began a discussion about a portrait in their collection. The life of the portrait’s sitter, Winston Churchill, has been very well documented, unlike that of the portrait’s maker: ‘G. W. Fish’: the collection only knew that the artist was active in Birkenhead from 1893 to 1894, and the portrait itself a ‘gift from R. F. Ware, 1903’. Martin Hopkinson immediately spotted a signature on the work, which appears to read ‘George W. Fish’. This extra forename may have helped Osmund Bullock to then gather and present a wealth of information, including the notably tragic tale of the artist’s family life. George William Fish, Osmund explains, was born on 22nd February 1876, in Birkenhead. He was christened at Walker Street Methodist Chapel, which is now Tranmere Methodist Church. In 1881 and 1891, records indicate George was living with his family – which comprised of his mother, father, two elder brothers and one sister – on North Road, Tranmere. By 1901 the rest of the Fish family moved to Accrington, where the 25-year-old George William is listed as an artist, and in 1911 the family had moved again, to Hoylake back on the Wirral. George William Fish is listed in Johnson & Greutzner's 'British Artists 1880–1940', which recorded exhibiting artists at most important British venues. The volume gives two entries for G. W. Fish exhibiting at the Liverpool’s Walker Art Gallery, in 1893 and 1894. The artist, born in 1876, would have been only 17 and 18 at the time, respectively. Osmund wondered ‘if the shock of his father's suicide two years later, and the family's subsequent reduced circumstances, played a part in his unfulfilled early promise’: little can be found relating to the artist in his later life. However it may have been the same George Fish who died at the age of 55 in Barrowmore Hall Sanatorium near Chester, on 21st March 1930. After Gallery Oldham expressed their thanks to Osmund and the other contributors for providing such a biography, Martin Hopkinson raised a further question: the two exhibited works listed in Johnson & Greutzner were watercolours. Fish does not seem to have been associated with the Society of Portrait Painters, so why did the already prominent Churchill sit for Fish? What were the circumstances of the portrait’s creation? Barbara Bryant noted that the donor R. F. Ware was the Oldham Conservative Association's Organizing Secretary and Registration Agent, and probably known to Churchill. 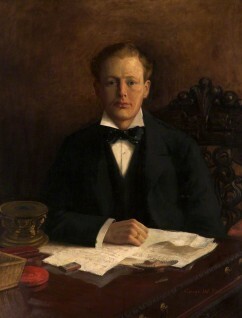 Perhaps the portrait was intended ‘to hang in the Conservative Association offices, to promote the career of the rising young politician.’ Osmund noted an article that indicates the work was in the Oldham Corporation Art Gallery by late 1902. This suggests ‘Ware and the Conservative Association loaned it for the occasion of Churchill's appearance to open the Russell Coates exhibition’, and perhaps its popularity meant the painting stayed to become part of the permanent collection. Gallery Oldham confirmed that council minutes, 10th December 1902, note a thank you letter was sent to the donor R. F. Ware dated 6th January 1903, which means the portrait must have been commissioned after Churchill's election in autumn 1900, and before it was displayed in the Gallery in 1902. Finally, Andrea Kollman contributed two notes: Churchill asked for photographs of the painting in 1947, which indicates he liked it. Also, Churchill the chair depicted in the painting was a family heirloom, which makes an appearance in a painting of Churchill’s father, and other later portraits of Churchill. Barbara Bryant noted this means it is likely Fish travelled to Churchill’s residence to paint the portrait. To summarise, Barbara Bryant noted that the discussion was very productive: we discovered much about the artist, and the portrait makes for a fascinating addition to the Churchill iconography (currently not listed in Churchill's ODNB entry), since earlier views of sitter are rare. If any Art Detectives have any new information about this painting, please propose a discussion by following the Art Detective link on the artwork's Your Paintings page. Does anyone have any information about the artist, G. W. Fish?